Abu Dhabi, the capital and second most populous city of the United Arab Emirates (UAE), continues to move forward with its fintech agenda, with the Abu Dhabi Global Marketplace (ADGM) driving the strategy. Abu Dhabi has recently been recognized as the top fintech hub in the Middle East and North Africa (MENA) region. The city is known for having launched the first fintech regulatory regime in MENA, but also the first fintech Regulatory Laboratory, and for being the second globally most active regulatory fintech sandbox, preceded only by London. The ADGM is playing a key role in the development of Abu Dhabi’s fintech industry and has just recently been recognized as the Fintech Regulator of the Year 2018 at the Seamless Middle East Awards ceremony in Dubai. Last year, several initiatives were triggered to foster the growth of new and innovative fintech solutions, and this year looks to be no different. 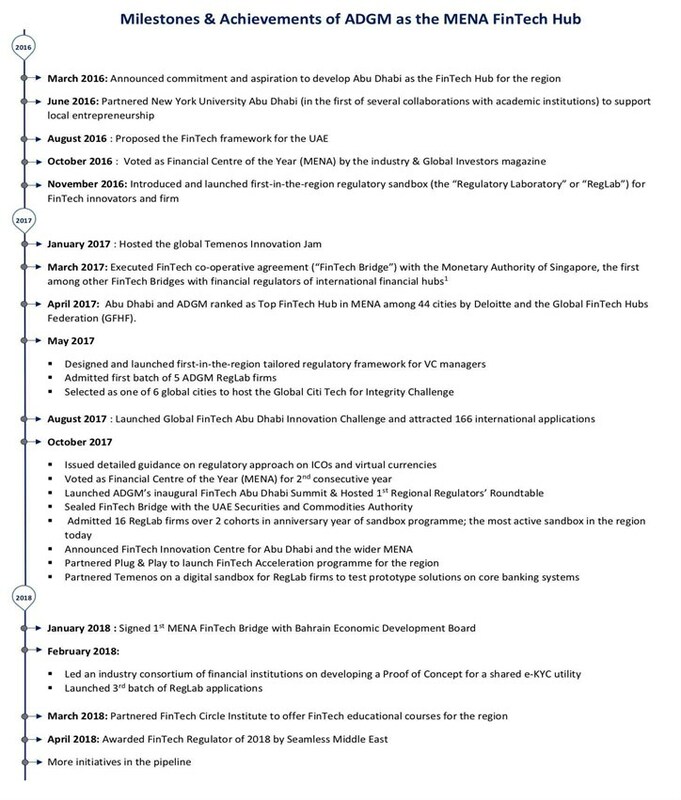 For instance, the Fintech Innovation Centre and the partnership with renowned startup accelerator Plug Play, unveiled in October 2017 by the ADGM, aim to support greater financial innovation, cultivate fintech talents, foster closer industry collaboration and facilitate more cross-border investment opportunities. The center will also be home to participants of ADGM’s regulator sandbox (also refered to as RegLab) dedicated to regtech startups and companies. The sandbox, launched in 2016, welcomed its first batch of fintech startups in May 2017, which included two local UAE fintechs (Now Money and Titanium Escow), two Indian startups (CapitaWorld and Rubique) and one from the US (Finalytix). Later that year, the ADGM held the inaugural two-day Fintech Abu Dhabi Summit, which attracted major names from across the region and beyond, including Saeed Amidi, chief executive of Silicon Valley venture capital fund Plug and Play, and Fadi Ghandour, the executive chairman of Dubai-based venture capital firm Wamda Capital. The agency also hosted the first regional regulators’ roundtable. 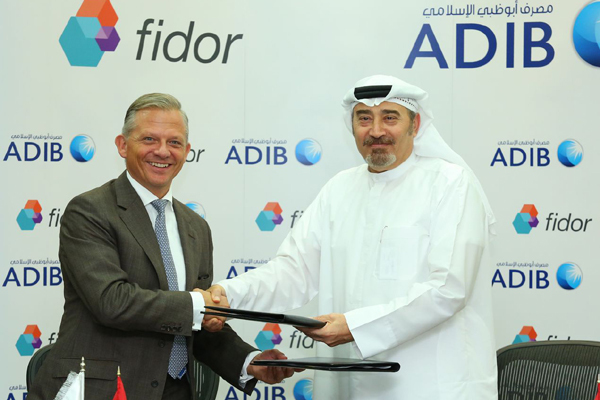 Earlier this year, the ADGM has unveiled plans to launch a shared electronic-Know-Your-Customer (e-KYC) utility in close collaboration with a key team of the UAE’s largest financial institutions, including Abu Dhabi Commercial Bank, Abu Dhabi Islamic Bank, Al Ansari Exchange, Al Fardan Exchange, and UAE Exchange. The consortium will develop a proof-of-concept to decide the governance framework and the functional requirements of the e-KYC utility. Distributed ledger technologies are being considered to underpin core functionality within the platform. One area in particular that the ADGM took the lead is initial coin offerings (ICOs) and cryptocurrencies, being amongst the very first regulators in the world to look into this thriving industry. In October 2017, Abu Dhabi’s Financial Services Regulatory Authority (FSRA) released guidelines on ICOs and cryptocurrencies, stating that if a token has the characteristics of a security, the FSRA would regulate it. With over 30 fintech startups, the UAE is the largest fintech market in the Middle East, representing 33% of the region’s overall fintech industry. In addition to hosting the greatest number of fintech startups, the UAE is also home to some of the region’s top ventures. For instance, Remitr, by global remittance company Remitware Payments, is an online platform for cross-border payments for family expenses, higher educations, investments, loan repayments, insurance, utility bills payments, travel bookings and more. Remitware Payments has offices in Abu Dhabi, Dubai and Toronto, and recently launched MoneyOS, a blockchain-based operating system for global payments. Download the UAE Fintech Startup Map and report here.